On election day, 9 September 2018, more than four out of five Swedes went to the polls to cast their votes. 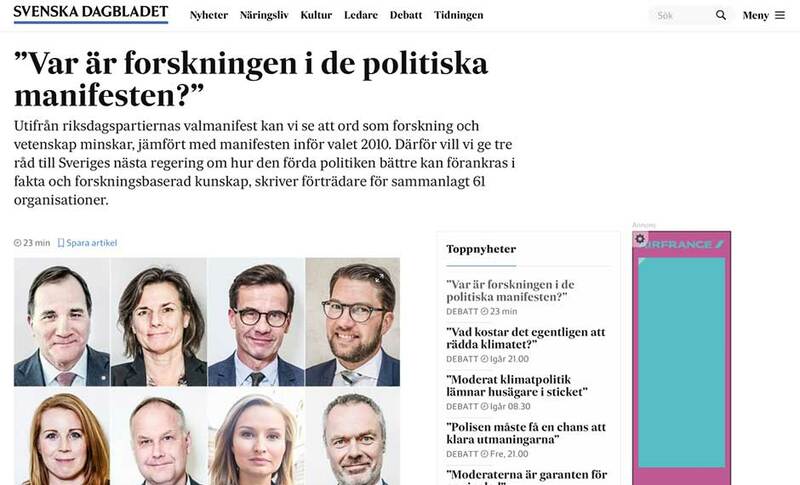 On the same day, 61 national organisations, companies and authorities published a joint opinion piece in the national newspaper Svenska Dagbladet on the fact that there has been a substantial decrease in the use of research-related terminology in this year’s election manifestos. 1. Commission more systematic reviews of research-based knowledge existing within specific fields. Independent experts, as well as authorities and government officials, should more often be assigned to compile broader reviews. 2. Reforms should be based on available research results and evidence and their impact systematically evaluated. If possible, undertake pilots before implementing nationally. 3. Encourage researchers to engage with society and create incentives for them to participate in public debate and outreach activities as part of their academic profession. The full Swedish text was published online by Svenska Dagbladet Debatt on 9 September. #hurvetdudet? (How do you know that?) is a campaign to promote more evidence-informed election campaigning in the run up to the Swedish general election. The campaign is coordinated by VA (Public & Science) and follows the success of March for Science in Sweden. Read more at hurvetdudet.nu.